Daily Illuminator: Think You Have The Latest Gear? Think Again! August 15, 2011: Think You Have The Latest Gear? Think Again! The problem with shopping for a mentalist is that he generally knows what you're going to get him before he unwraps the package. For this common problem, we at e23 have a modest solution. Pick up a copy of GURPS Psi-Tech, and use its exhaustive catalog to find something surprising your cerebral recipient will love. If you need to detect, enhance, or disrupt psi abilities, we have dozens of pieces of psychotronic equipment, ranging from the psi-amplifier headband to symbiotic crystals to the overload-field generator. If you prefer to peruse more organic options, check out our extensive assortment of bio-psi: drugs, implants, and virus-like injections, all designed to help make up your mind. This fine volume even has information on the science of psi, so you know where great brains have gone before. 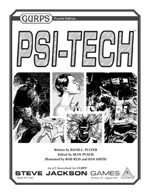 Whether you're in the market for a Kirlian camera, a deathscanner, a psi-bomb, or any of a hundred other fun items for your deep thinker, GURPS Psi-Tech is the only catalog you need. And it's full of items for any huge budget, ranging from very expensive to very, very expensive. However, this thought-provoking catalog itself is a bargain, and it's available today for direct download to your preferred neural net via e23.